Yesterday I participated in the Farm City Fair hosted by the French Institute Alliance Francaise. 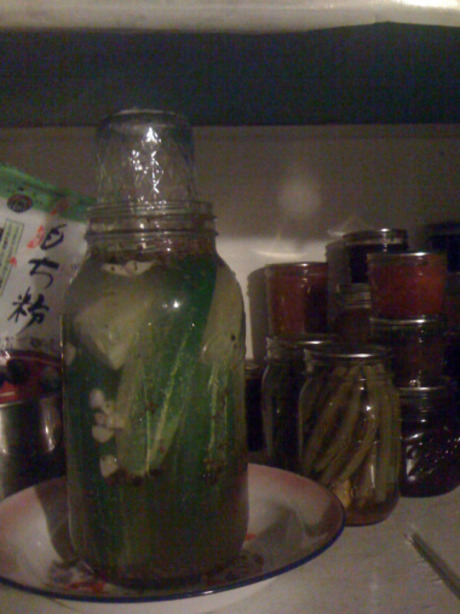 Over the past couple months my pickling endeavors have expanded into the wild world of fermentation. I haven’t mentioned it here until now because I wanted to be sure I knew what I was doing. Handing things over to microbes involves patience and a good bit of trust. 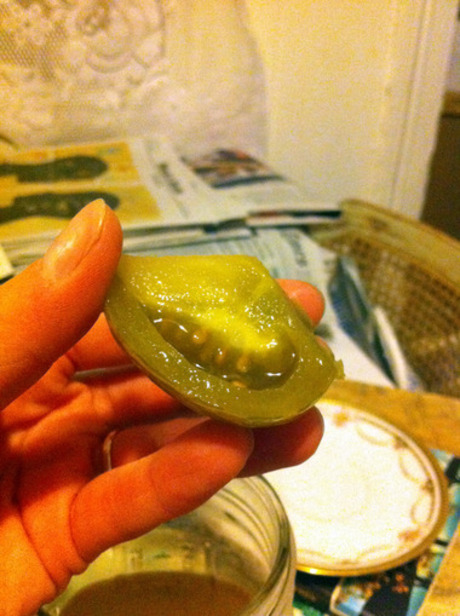 Fermented pickles (also called brined, or salt brined) are perhaps one of the best things you could put in your body. Lactobacillus and your stomach go well together. These are not vinegar pickles (like I was describing yesterday) but pickles that become pickles because of the handiwork of bacteria. I’ve tried my hand at kimchi (rather the Japanese relative called ‘kimuchi’), sour beets, Lower East Side dills and green zebra heirloom tomatoes, all with varying degrees of success. My two favorite books to read all the in’s and out’s of fermented pickles are Linda Z’s The Joy of Pickling and (the fermentation bible) Sandor Ellix Katz’s Wild Fermentation. Between the two of them, I haven’t been confused about anything. 1. Place 2 tsp dill seed, 1/2 tsp cayenne powder and 2 cloves of garlic, slivered into a clean, wide-mouth quart jar. 2. Quarter or halve 3/4 lb firm (unripe) green zebra heirloom tomatoes* (that’s about 5 medium sized tomatoes) and drop into jar. 3. In a separate jar or container combine 2 cups filtered water with 1.5 Tbs pickling or Kosher salt until salt dissolves. Pour salt brine over tomatoes to cover them completely. 4. 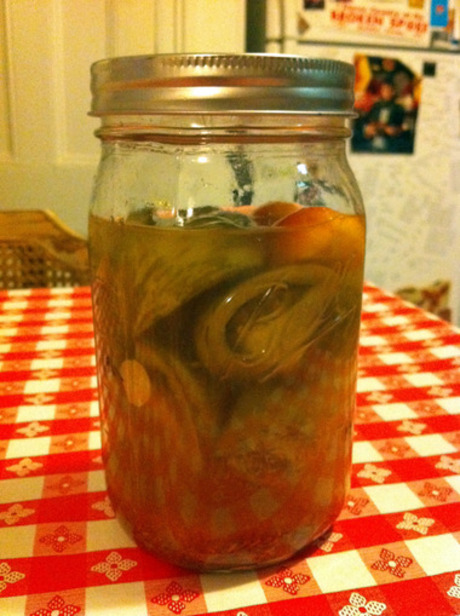 Place a clean, 8-oz jelly jar inside the rim of the pickle jar to weight tomatoes down in the brine. Fill jelly jar with water if necessary to weight down the tomatoes. These are the dill cukes, but you get the idea.It’s also an excellent precaution to place the jar in a low dish or on a plate since the fermentation action causes bubbling and off-gassing which could slosh the liquid over the edge of the jar. Cooler, dimmer places work best for fermentation, but my hot little kitchen pantry shelf (my only option) worked out just fine. 5. Check on your pickles every day. In the first three days you’ll notice bubbling and frothing around the rim. Do your best to skim excess foam off (without scooping out the spices that have floated to the top). This keeps yeasts, molds and less desirable bacteria from taking over in your jar. Rinse and clean the jelly jar weight when you skim, too. *sub speared carrots or halved/quartered pickling cukes for tomatoes and enjoy other feremented veggie variations!